My first turkey ... now what? Eating Well is one of my favorite magazines because their recipes all have some sort of low-fat, high-fiber, hearty-healthy twist. I also love it because I get it free at work, but that’s beside the point. The January/February issue is packed with a ton of recipes I aim to try soon, including Cod with Tomato Cream Sauce and the Rack of Lamb with Warm Apple & Lentil Salad. First up, though, was their recipe for Brothy Chinese Noodles, which I made earlier this week. While their recipe looks fantastic, I did doctor it a bit to account for my taste preferences and to use what I had in my kitchen. For example, while they call for hot sesame oil, I used regular sesame oil and brought the heat by way of Sambal Oelek, a chili sauce that is always in my fridge. I also amped up the garlic (four cloves instead of two) and bok choy, because why go for only three cups when you’ve got a huge bunch? Heat one tablespoon oil in large saucepan over medium heat. Add ground turkey, all but two tablespoons of the green onions, garlic and ginger and cook, stirring and breaking up the turkey, until the meat is no longer pink. Transfer to a plate. Add broth, bok choy, noodles, soy cause, vinegar and remaining tablespoon of sesame oil to the pan. Bring to a boil over medium-high heat and cook until noodles are tender. 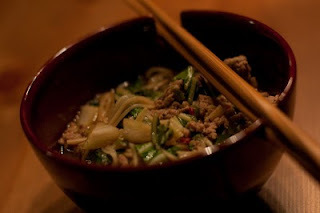 Return turkey to the pan, stir in the Sambal Oelek, scoop into bowls and garnish with remaining green onions. I’ve got a trunk full of reusable shopping bags, and, like snowflakes, no two are alike. I do my best to avoid bringing home paper or plastic, and take pride in my collection of bags, which range in size and textile. My newest bag, a Christmas gift from my boyfriend’s sister, is getting rave reviews from grocery clerks. 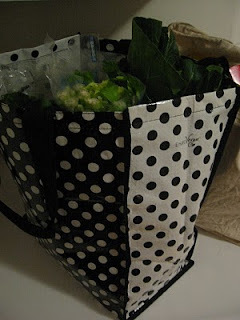 Two separate checkers at two separate stores, plus a lady behind me in line at the register, have all commented on (and complimented) my EnviroVogue Multi-Tote, which sports a bold black-and-white polka dot pattern — way more flashy than my Trader Joe’s canvas totes. It’s quite sleek, and holds a substantial amount of booty. What’s also cool about EnviroVogue is that the Seattle-based company donates a portion of each bag’s proceeds to “good causes that inspire us” (as it reads on their Web site) such as the hunger-relief charity Feeding America. I’m also delighted to discover EnviroVogue makes mini-totes, which look like they’d make great reusable lunch bags. Most EnviroVogue Multi-Totes go for $9.95, while the Mini-Totes go for $7.95. Both sizes are available in a variety of patterns. It’s been quite windy, rainy and generally nasty the past couple days. 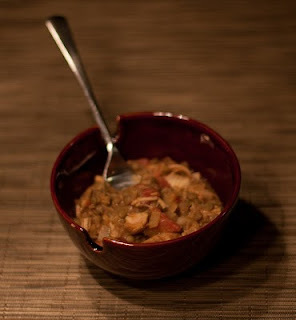 This dreary weather calls for soup! 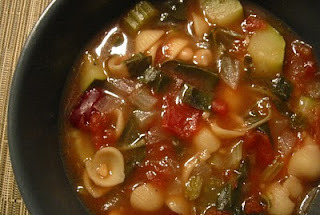 This was my first attempt at making minestrone, and I’m pleased with how it turned out. I just kind of picked out what I wanted in a soup, and am calling it minestrone because it sounded good when I was at the grocery store. Heat olive oil in large pot over medium heat, and add garlic, stirring 1-2 minutes before adding onions. Stir another minute before adding carrots, celery, zucchini, Italian seasoning and bay leaf. Sauté vegetables for 4-5 minutes before adding chard to the pot. Stir another minute or two before adding broth, tomatoes, beans and pasta. Cover, and allow to simmer for 20-30 minutes, until pasta and vegetables are tender. Ladle soup into bowls, sprinkle with Parmesan and serve. We had a big, late breakfast this morning, and I planned on making a hearty dinner later, but wanted a quick, healthy snack to keep the energy up in the middle of the day. 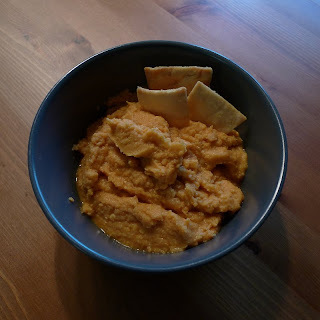 So, while at the grocery store this afternoon I picked up some garbanzo beans and decided to take a crack at making hummus. I would have added tahini, but apparently my local Safeway doesn’t carry the sesame seed paste used in a lot of hummus recipes. Nonetheless, the dip turned out pretty well and has a fresh flavor, thanks to lemon juice, and a little something extra from the smoked paprika, my newly discovered favorite spice. Throw all ingredients in food processor or blender, and mix until ingredients form a paste. Serve with pita chips and vegetables. I bought a frozen turkey right before Thanksgiving, planning to roast it sometime during the holiday season. Between traveling and all kinds of end-of-year festivities, I didn’t make time to defrost and roast the bird until this past weekend. 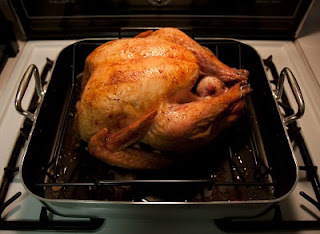 This was my first time roasting a turkey, and it was pretty darned easy, once I removed all its nasty bits. The 15-pounder fit nicely in the roasting pan Chris got me for my birthday. I didn’t do anything fancy, just brushed the bird with some olive oil and rubbed in a little mixture of smoked paprika, cayenne, garlic powder, onion powder, and dried oregano and thyme. It took about 3.5 hours at 325 degrees before my meat thermometer read 170 degrees in the thigh meat. The turkey was moist and flavorful, and now I’ve got a fridge full of white and dark meat. Let the fun begin! One of my favorite things about turkey-centric holidays is the abundance of leftover meat and figuring out what to do with it. My mom, for example, knocks out some of the leftovers by making turkey enchiladas, which I’ll likely do later this week. First up, though, is an adaptation of a recipe I recently found via the Associated Press. The shopping list is short and inexpensive, especially at Winco, where I found bulk lentils for 79 cents per pound, yellow onions for 48 cents a pound and a 14-ounce can of diced tomatoes for $1.08. It was also nice to put to use the curry masala spice mix I already had in my spice cabinet. Combine lentils and enough water to cover in a medium saucepan and bring to a boil. Reduce heat and simmer until the lentils are just tender, about 30 minutes. Drain and rinse. When lentils have about 10 minutes left to cook, heat onions in a large non-stick pan over medium-high heat, stirring often, for 2-4 minutes. Add curry powder to onions and stir constantly for about 1 minute. Add the turkey, lentils and tomatoes. Cook until headed through, and season with salt. Remove from heat and stir in yogurt. You can’t win ‘em all. As previously mentioned on this blog, I signed up for the pie contest at work, entering not just one, but two, different desserts. I decided to make a chocolate almond pie and a caramel apple pie. Both seemed like doable desserts, even though I’ve never baked a pie in my life. Silly girl. 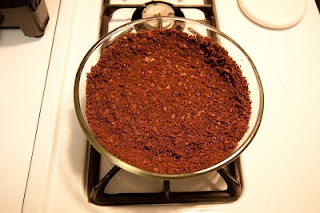 Although I was most worried about the crust, both my Nana Dollie’s 7-Up crust and a chocolate-graham-cracker base worked out great. What failed me in the end were the fillings. The caramel, while fun to make, had a too-tough consistency that didn’t really mesh with the Golden Delicious slices my recipe called for, and didn’t really melt while baking. What came out of the oven, while ringed with gorgeous, flaky crust, was quite a soupy apple mess. I tricked myself into believing the pie needed to set a little longer and loaded it into the trunk of my car, in what I thought was a tightly sealed and secured manner. That might have worked if I drove a straight line for 40 miles, but the turns and stops were too much, and I got to work and discovered the pie had tossed its cookies all over my trunk— caramel juice everywhere. Damn. Even though the apples still looked good, and the crust would have tasted fine, it would have been a joke to serve this up to the judges. Good thing I still had my chocolate almond pie, or so I though. 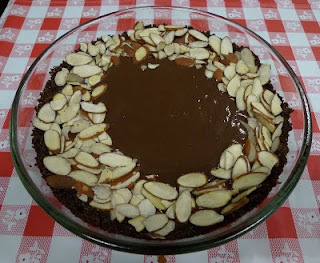 I had fun making the filling, a mix of egg yolks, tons of chocolate, cream and both vanilla and almond extracts. It seemed pretty firm even to the point when I took it out of the fridge at work and sprinkled the edges with sliced almonds. 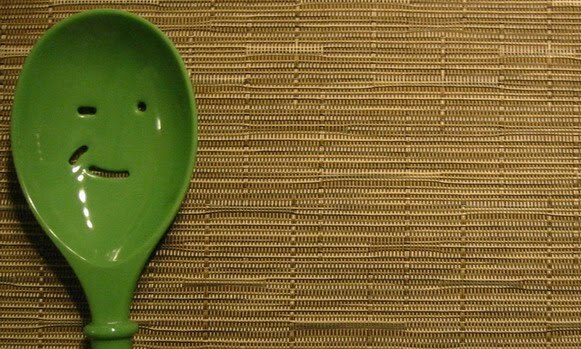 For whatever reason, this pie filling softened up really fast, too fast to be taken seriously among my competitors’ creations. Although neither of my pies won — that cash prize would have been pretty sweet — and I was bummed for about 5 minutes, I can laugh about it now, and know where to focus my efforts the next time I attempt to bake a pie. One of the things I like most about skiing is eating. I’m no double-black-diamond daredevil by any means, but barreling down the mountain run after run (for me, that’s mostly blues, some blacks) still burns quite a few calories. A day on the slopes means a day of digging into whatever I want. I started 2010 off in an awesome way, spending Saturday at Squaw Valley USA and Sunday at Sugar Bowl. Between the two days on two different mountains, I had plenty of time to sample each resort’s menu options. The Arc, one of Squaw’s mid-mountain spots (we got there by riding up the Gold Coast Funitel), makes a mean chipotle steak burrito, which has just the right amount of smoky heat. This burrito is quite filling and is best enjoyed on the porch, where we devoured lunch on the gorgeous Saturday. We headed down the hill for dinner at Twenty Two Bistro & Bar, one of the many dining options nestled into the Village at Squaw Valley. 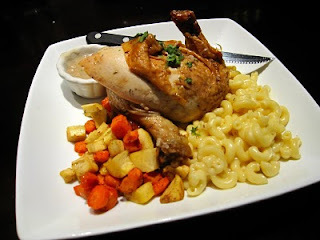 Perhaps I was craving comfort food, because I ordered the beer can chicken, which was served with macaroni and cheese, along with some nicely seasoned vegetables. It was heavenly. Sunday, like Saturday, was a beautiful blue-sky day, perfect for testing out runs for the first time at Sugar Bowl. I split my day between the Mt. Lincoln Express and the Disney Express lifts, stopping for lunch on the Village Lodge patio. 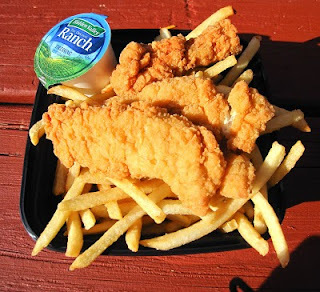 One of my absolute favorite snow-day indulgences is a chicken finger basket, and Nob Hill Café’s grab-and-go tenders hit the spot. There’s nothing better than unsnapping your ski boots, taking off the helmet and goggles and digging into a basket packed with chicken strips and French fries. That is, except for when lunch is over and you know you’ve got the rest of the afternoon to burn off more calories having a blast on the mountain, of course. Cheers to a delicious 2010. 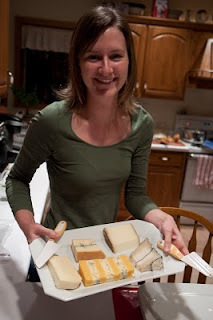 I look forward to many adventures, in and outside of the kitchen, this year, and wish the same for all of you!